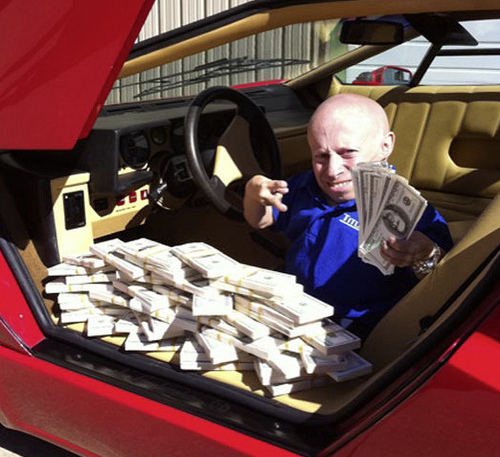 The world may know him best as “Mini-Me,” but Verne Troyer has had many other prominent roles in the entertainment industry. The Austin Powers movies helped him find greater mainstream success, but this Michigan native has been in the industry since 1994. Most of his early roles involved stunt work for movies, such as Baby’s Day Out and Jingle All the Way. Verne’s first official acting role was in Pinocchio’s Revenge, and he has subsequently had acting parts in Men in Black, Fear and Loathing in Las Vegas, How the Grinch Stole Christmas and the Austin Powers trilogy. In addition to film, Verne also regularly appears on television through stunts, bit roles and hosting. He starred in one of the most popular seasons of The Surreal Life alongside Adrianne Curry and Christopher Knight. While it is Verne’s small size that has dictated the course of his successful career in the entertainment industry, it has also undoubtedly presented a great deal of challenges. Standing at under three feet tall, Verne suffers from a rare type of dwarfism called cartilage-hair hypoplasia, in which the skeleton fails to develop full-term.